This is another version of the painting I did for a client. She provided the colors she wanted. I provided a subject that I thought would fit the colors and decided to approach it 2 ways- one vertical and one horizontal- to see which she would prefer. This is one of the last paintings I completed in 2012. Put the paints away and cleaned up the studio to spend the rest of the year with family and friends for the holidays. Best wishes to everyone for a happy holiday filled with love and beauty and lots to look forward to in the coming year. Thank you for your interest in art and for your support over this past year. I look forward to sharing the new art I create and any exciting news with you in 2013! Completed this painting this week based on a scene I saw while visiting a beautiful Chateau in France this summer. The place is called Vaux Le Vicomte. My main objective was to see how I could suggest the feel of the lavender flowers in the front without overdoing it. Here's the reference photo which inspired the painting. I repositioned things a bit and simplified it to improve the composition. Also changed the angle of the dark trees in the back to give it a diagonal for more movement and also not to split the page in half. This is a different version of a similar painting I did earlier this year. I love the white hydrangeas with the red berries. This one sold at the Spencer Gallery in Charleston a few months back, but I realized I had never shared it and the colors seemed fitting for the season. With all the holiday preparations and festivities last week, I did not paint since last Monday, so anxious to get back into the studio this afternoon. I've thought about painting the Duomo in Florence many times during my travels to Italy, but the building is so huge, complex and ornate that it is daunting. ( It actually took over 100 years to build and the dome was a major architectural feat at the time). This week, I finally attempted this subject in a small 9 x 12 study which required me substantially simplifying things. I was tempted to put in all the green marble design, but I gave up on that for something this small, just trying to capture the essence of the building shape in the context of the hills of Florence as a start. 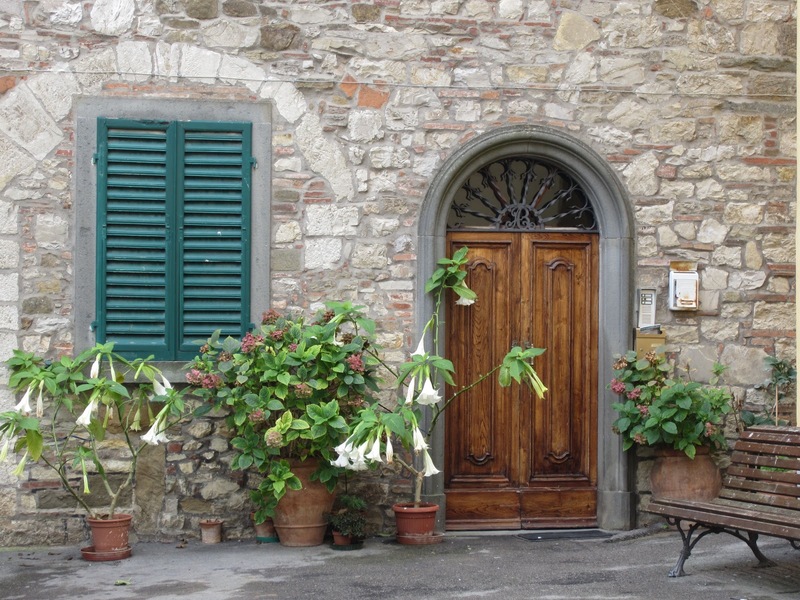 Love the combination of stone walls contrasted with soft plants/ foliage in sunny Italy. The flowers are a happy welcome at the front door. 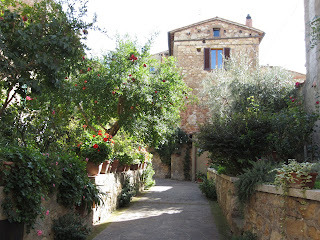 This is a closer view on some of the plants I discovered in the sunlit courtyard in Pienza Italy. You can see the full garden scene in a previous pos. See Blog post Nov. 2. Completed this painting over the weekend. I did a version of it when I first was learning to paint in oils so I decided to give it another try to see how I could improve upon the original. Happier with the brushstrokes the 2nd time around. Every once in awhile it's a good thing to revisit something you've done before to see how much you've grown or how you come up with new approaches for the same inspiration. I have to admit I'm not really I cat person. I grew up with dogs and am totally a puppy lover, but while in Siena, Italy last month, I saw a cat perched in a window looking down to the street. It was just waiting to be painted. I have never painted a cat before, but having mustered up the courage to try something out of my comfort zone last month with the first car painting I ever did, I figured I'd give it a go. Kept trying to forget it was a cat and just looked to simplify shapes, light and dark. I was pretty happy with the results. A sunlit view of a restaurant at the end of the main street in Pienza Italy. Experimenting with a little thicker paint on this little study. Continuing to work on my Italian series, fresh back from my trip to Tuscany in October. This scene from a small town- Radda in Chinati. The day we were there it wasn't that sunny, but my feelings about Italy are mostly associated with the joy and warmth of dramatic sunlight, so I took a little artistic license here to alter the values and colors .. and okay, maybe added some more plants. The original reference photo is below. 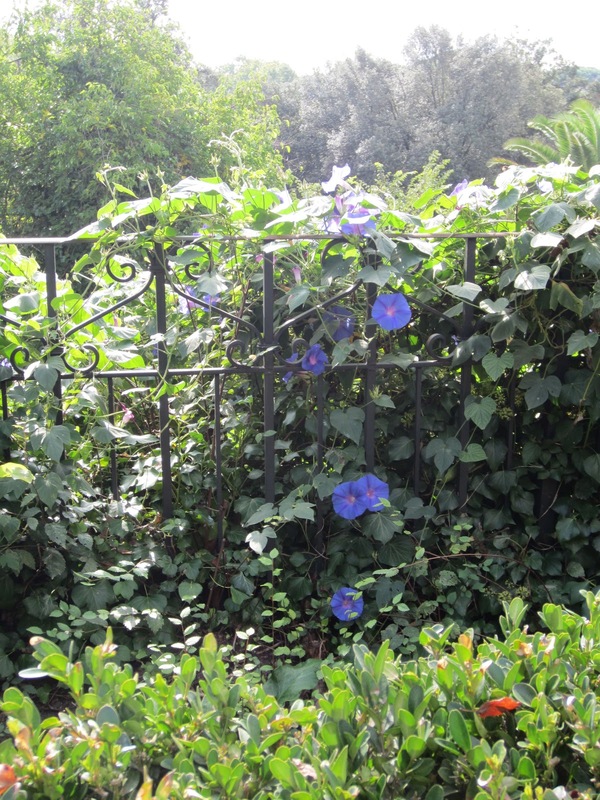 While in Rome, I recently visited the Villa Borghese Gardens and came across these beautiful flowers and vines. Below is the original photo which I modified to create a different pattern of light and shadow which resulted in the painting above. 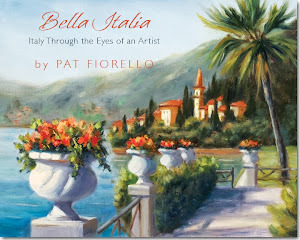 This painting was inspired by the charming town of Limone on the shore of Lake Garda in Italy which I visited last fall. Lake Garda is in northern Italy, not far from Switzerland. It's not as well known by Americans as Lake Como, but is just as beautiful and is a vacation destination for many Europeans. 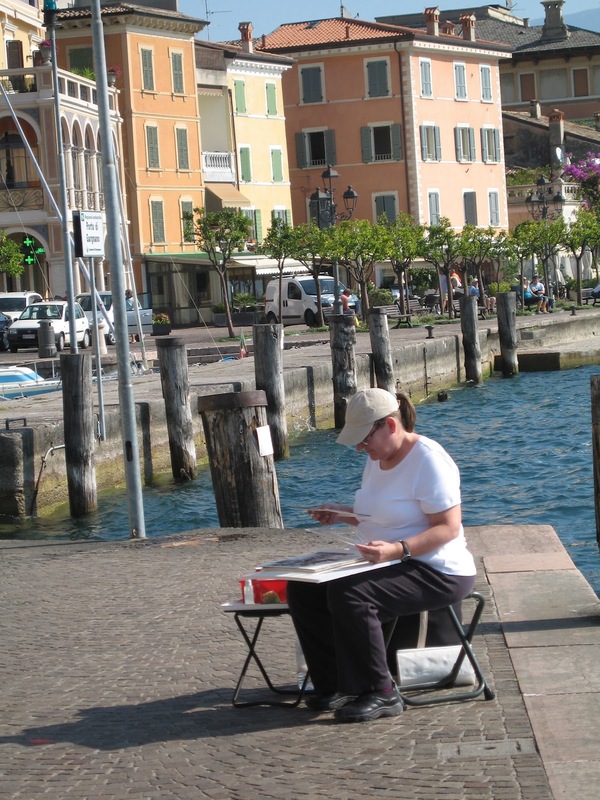 Lots to paint- classic Italian architecture, the lake, mountains, tropical/Meditteranean foliage (e.g. lemon trees, palm trees, bougainvillea). I'll be returning to teach another workshop there next fall. If you'd like to come paint with us, please let me know. Details are on this flyer and you can save your space by registering on the Il Chiostro website . This painting was actually inspired by a place I visited on my trip to Lake Garda, Northern Italy last year . I loved the light and even had done a value sketch awhile back in preparation, but had never gotten around to painting it till now. I've just begun a new series of paintings from my most recent trip to Italy When I returned last week, I loaded the 1100+ photo's I took on to my computer culled thru to get down to the top 85 or so and form there printed out about 15 that I could not wait to paint. Those are typically the images that grab me emotionally and also have good design potential in terms of light and shadow patterns. I put those photo's in a binder and then each day that I am ready to paint it's like going into a box of chocolates. I know I love them all, but which one will I choose today? I find this prescreening process helps me to have ready reference material for inspiration yet gives me some freedom to choose what I am in the mood and excited to take on any particular day. 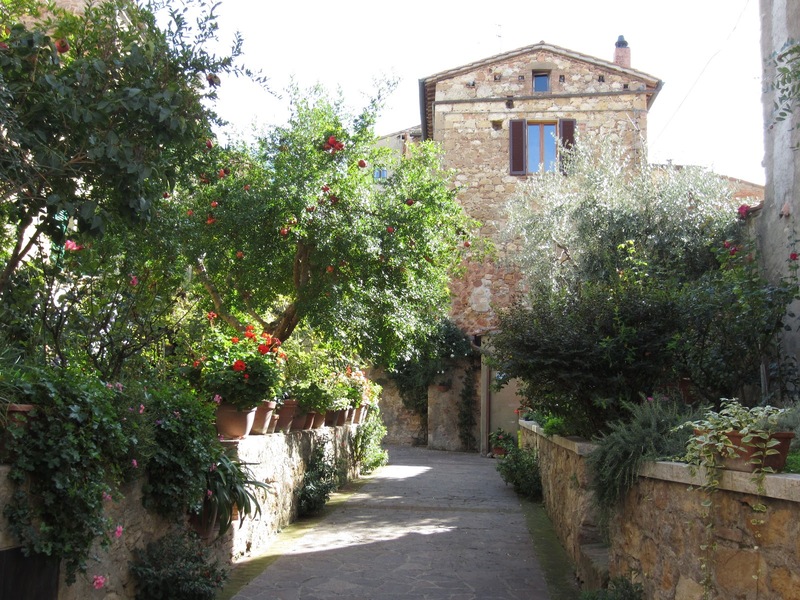 Pienza Garden is first one I chose to do. 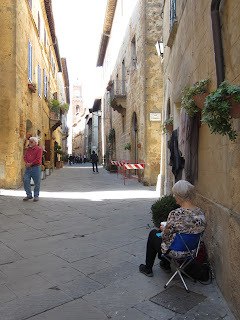 Pienza was a new town I visited and I fell in love with it. Up till then I had taken 500 photo's on my trip and that afternoon I took 300 just in Pienza. It exudes classic Italian charm. A pretty little town with lots of great architecture, great views and I even found a little hidden garden. The sunlight was great which always helps me find interesting compositions. The photo I took of this particular area had started out as a rectangle( original photos is below) but I wanted to see how it would look as a square format. I was pretty happy with the first in this series. At least for me, it did capture the feeling of joy that I had standing in that sunny garden spot. I just posted this painting in conjunction with an on-line art fundraiser to contribute to Hurricane Sandy. It's always difficult to see and comprehend the destruction, disruption and impact these types of events have on people and communities, but this one hits close to home for me. I grew up in NYC and lived in NJ for many years before moving to Atlanta. All my family lives in Brooklyn, Staten Island, NJ, Connecticut- everyone is okay, just shaken up and all still without power. My heart goes out to those who have lost family, homes and their sense of life as they once knew it. A number of artists are contributing work to raise funds to help. I contributed this painting for auction with a starting bid of $25. It will be open for bid for 7 days with 100% of the proceeds going to the recovery fund. Thanks for your concern and compassion in the face of this disaster, in whatever way you choose to express it. 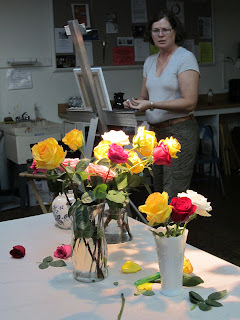 This is a little study I did trying to capture the light on some roses. Did this right before I left for Italy earlier this month. I haven't gotten back in the studio yet since returning on Monday night. Thought I might do so today but instead I spent the day culling thru my new photo's from this latest trip to Tuscany. I went thru over 1100 photo's, selected the top 85 and then from those picked about 14 that seem to have the most potential for strong paintings. Been working with those images today, printing, cropping, looking at value patterns etc..
Did a small value sketch of the one I want to do first, so hope to get started tomorrow. I'll post new work as this new series unfolds. You may have noticed my blog has been quiet for a couple of weeks. I was teaching a painting workshop in Italy and just got back last night. 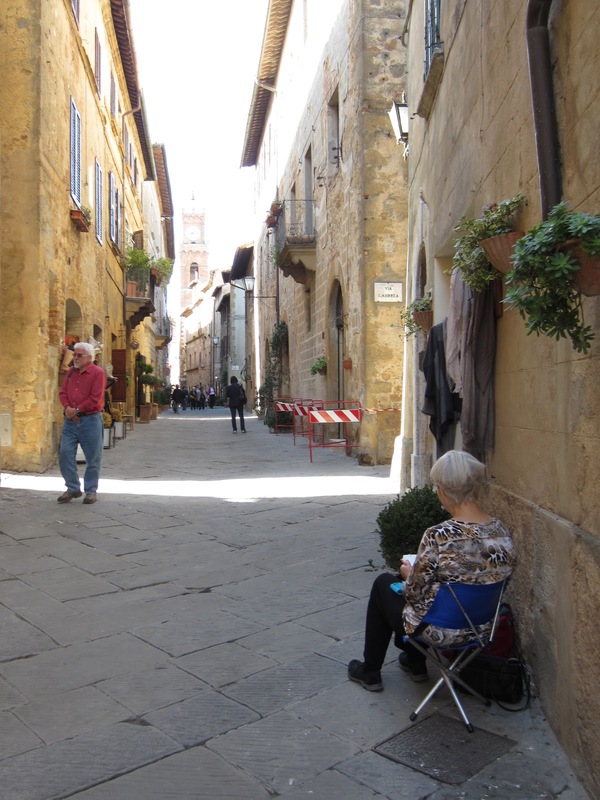 We spent a week in the Tuscan countryside painting and tacked on a few days before in Rome and a few days at the end in Florence. I've taught at the same location for the past 5 years, and the familiarity is nice, but it's also fun to visit some new towns. This scene is from Piensa. It was my first time there and it was probably the highlight of the week. Great sun and shadows and I took over 300 photo's there that day. The title of this post "Eat, Paint, Shop" pretty well sums up a perfect trip. Below are some photo's of my students painting on location in Piensa. Here's a piece I worked on this week, with an emphasis on capturing the light streaming in from a nearby window and also keeping brushstrokes a little looser. Here's the photo inspiration which I altered a bit. 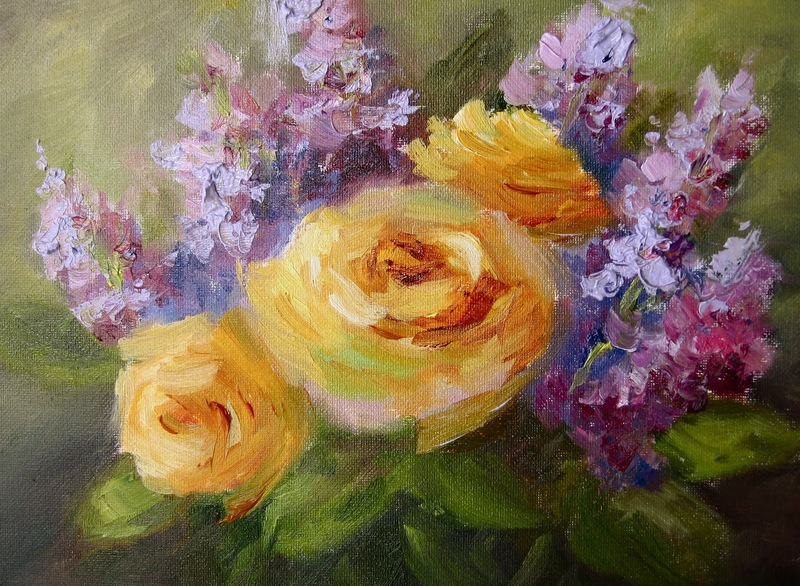 I had a request for a painting of flowers for a yellow kitchen with some blue accents. I had recently finished the yellow roses and white hydrangea demonstration in my class but the size was too small and I thought the dark background might be a little serious for a small kitchen. So using the photo's of the orignal set up for inspiration. I made a few adjustments. 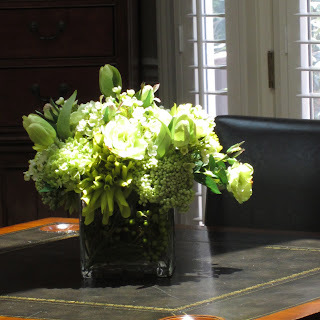 The canvas was much larger so I had more room to lengthen the vase. I also made the background a slate blue grey ( it's a little more neutral in reality than it's showing up on my monitor) . The lighter background gives a whole different mood from the original which is shown below. Well this one was definitely outside my comfort zone. I paint a lot of green things - landscapes, flowers, but this is the first oil painting of a car I've ever done. I did a watercolor which included a car many years ago, but it was a minor element of the painting, not the focus. Recently, I had a collector of mine, who I just finished 3 commissions for, ask if I could paint her husband's car for a gift. I was a little unsure since I hadn't done that type of subject before, but I said I'd give it a shot. To get over my initial skepticism, I tried to convince myself it was just a shiny rectangle with some details. Once I got started, the challenge was actually fun. I've heard it said, learning doesn't happen when you are in your "comfort zone" nor in the "panic zone". Only when you are between those 2 spaces are you in the " learning zone". I have to admit it was fun to figure out how to get started and how to depict certain elements like a sense of reflected light on the side of the car and try to keep it not too overly detailed. The tires were the toughest part to simplify- there were tons of spokes which I tried to suggest but not report precisely without losing the spirit of the car. I delivered it today and my client was very happy. On another note, I was recently asked to put some of my small paintings into floater frames. I looked on-line and found some options, but many were deep and I typically work on panels rather than thick stretched canvas, so that type wouldn't work. I did discover a wonderful framer, Mike Schmidt of Framer's Outlet in Lawrenceville , GA. He put them together for me exactly as I needed them and did so quickly and at a reasonable price. Even if you don't live nearby, he will ship to you. He's been framing for 30 years. Here's an example of one of my 6x8 paintings in the floater frame. This one is walnut, but he had several other options.